The sweat bee genus Lasioglossum is the largest of all bee genera, containing over seventeen hundred species in numerous subgenera worldwide. They are highly variable in size, colouration, and sculpture; among the more unusual variants, some are cleptoparasites, some are nocturnal, and some are oligolectic. Most Lasioglossum nest in the ground, but some species nest in rotten logs. 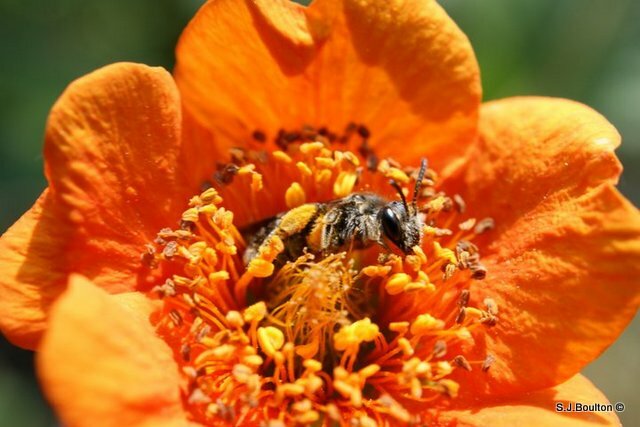 The term oligolecty is used in pollination ecology to refer to bees that exhibit a narrow, specialized preference for pollen sources, typically to a single genus of flowering plants. The preference may occasionally extend to multiple genera within a single plant family, or be as narrow as a single plant species. 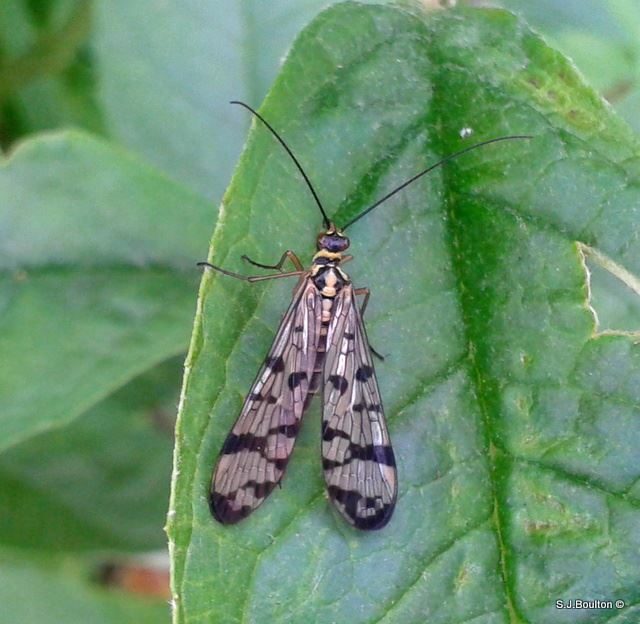 Panorpa is a genus of scorpionflies that is widely dispersed in the Northern hemisphere. However, they do not occur in the western USA and Canada. About 240 species are described as of 2007. Length 13 to 15 mm. 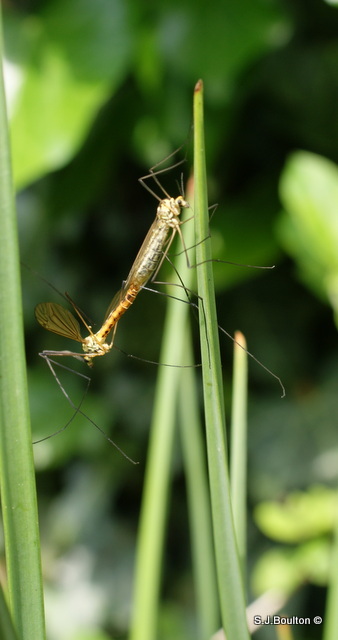 Spotted Craneflies have a yellow body with a broad black strip on each section of the abdomen, and a series of black stripes on the thorax. The wings have a very thin yellow line near the leading edge. Adults feed on umbellifers such as Cow Parsley. Larvae feed on the roots of grasses. 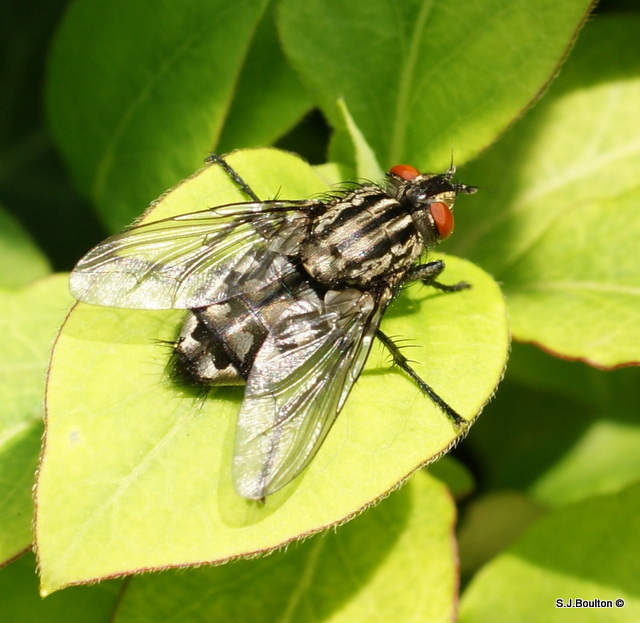 Flesh fly (family Sarcophagidae), any member of a family of insects in the fly order, Diptera, that are similar in appearance to the house fly but are characterized by blackish stripes on the gray thorax (region behind the head) and a checkered pattern of light and dark gray on the abdomen. Most flesh flies are tropical, although the family is generally widespread. Many species are scavengers, with the larvae developing on either open wounds or carrion. Depending on the species, the female deposits live larvae or eggs. 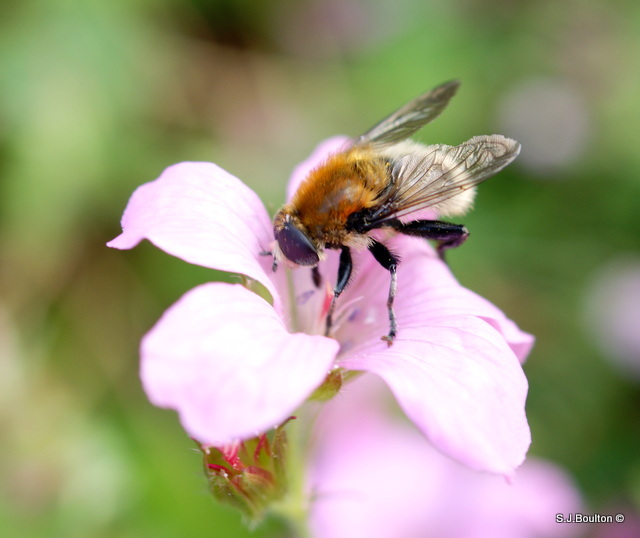 A common medium-sized hoverfly, often found in gardens, the Narcissus Fly (also known as the ‘Greater Bulb Fly’) is a bumblebee mimic. Adults feed on nectar and pollen and can be seen around flowers like dandelions from March to August. Males can be spotted flying low over short grass in search of females. While females can be seen on the dying leaves of bulbous plants, such as Daffodils, Narcissi and Bluebells, where they lay their eggs. The larvae hatch and burrow into the bulb underground, feeding on it and even destroying it. 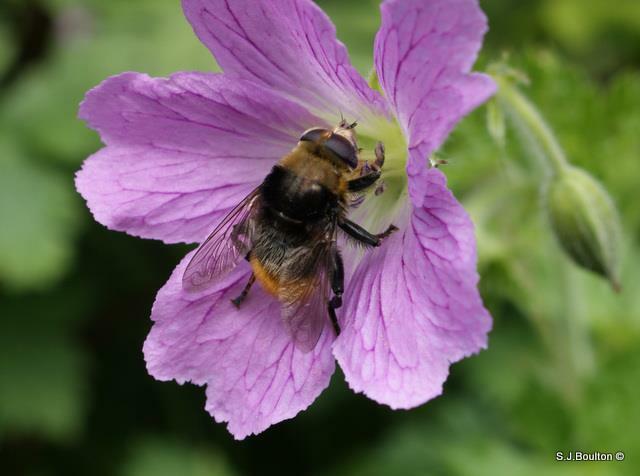 Covered in ginger hairs, with a black band around the middle and creamy tail, the Narcissus Fly is one of several species of bumblebee-mimic hoverflies. Common around Daffodils and Bluebells. 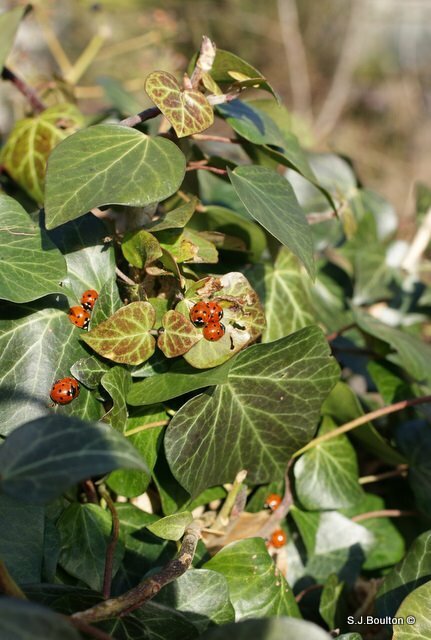 This photo was taken spring 2012 , there were 100’s of seven spot lady birds coming out of there winter hiding place in the ivy hedge. This year due to the long cold winter I can say I’ve only seen a couple, the winter has taken a toll on them which is really sad. Seven-spot ladybirds are, or should be, a gardener’s best friend as they are natural allies against devastating aphids. These beautiful beetles, and their larvae in particular, are avid and very active aphid predators, devouring more than 5,000 during their year-long life. The seven-spot is easily one of Britain’s most common and easily recognised beetles. As well as across their natural range in Europe, seven-spots now live wild in North America where they were introduced to help control aphid pests.